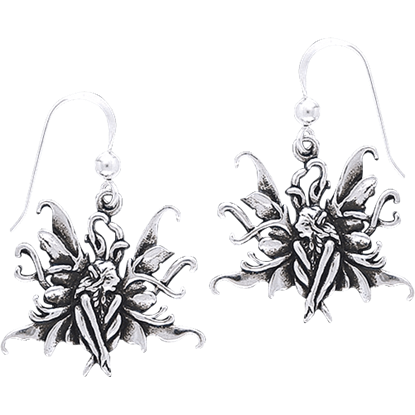 Let little fairies adorn your every outfit when you wear our fairy earrings! We carry a vast selection of fairy jewelry, including fairy stud earrings, fairy ear cuffs, and dangling fairy earrings, so you are sure to find a fairy earring form that suits your style here. 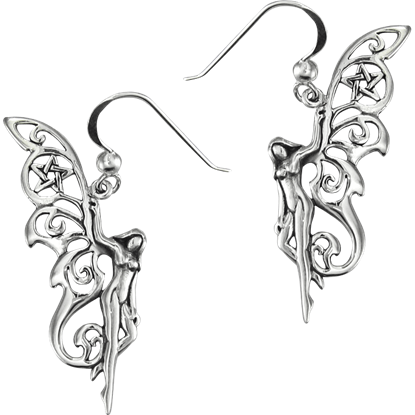 Our fantasy fairy earrings are made of high quality materials, like sterling silver, white bronze, and fine pewter, and they can be used in complex fantasy looks or everyday subtle displays of fantasy style. Shop butterfly fairy wing earrings, fairy gemstone earrings, and more, all inspired by the realm of fairies and the wonder they inspire in the modern world. Inspired by the Chrysalis Fairy artwork by artist Jody Bergsma, these charming fantasy earrings make a lovely accessory to finish off your look. 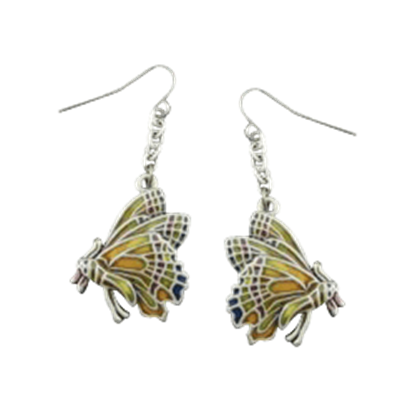 The Chrysalis Butterfly Earrings show off detailed butterflies with bright coloration. 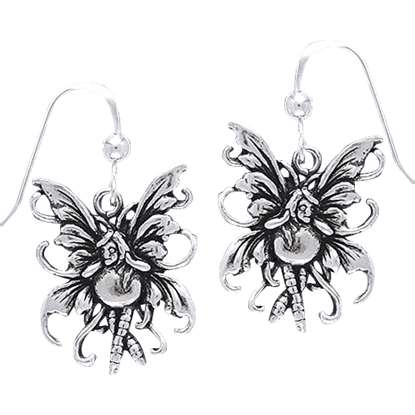 Now you can easily complete the look of your outfit tonight with the dazzling Fairy Seated Earrings. This jewelry set will quickly become a treasured addition to your personal wardrobe, so grab a pair while you can. 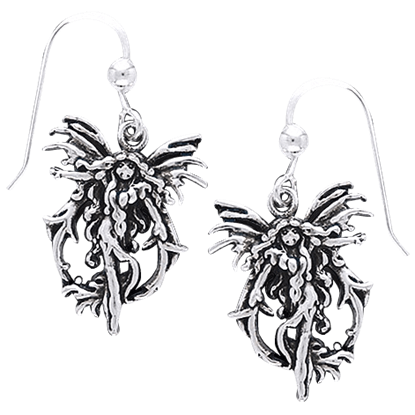 Although fairies are usually attributed with innocence and playfulness, some fairies have a more powerful side, and the Fire Element Fairy Silver Earrings honor these less docile creatures with a bold silver accessory. Elegant and attractive are two words that describe this pair of pixies. 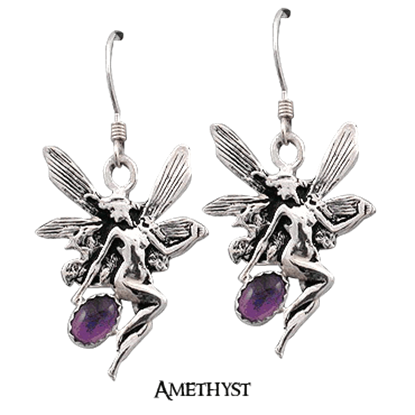 The Silver Nouveau Fairy Earrings with Gemstones are a pair of attractive decorations that any woman can wear when she wants to show off her own fairy style. Even when they are rendered in the form of jewelry, fairies are still quite the lively bunch. 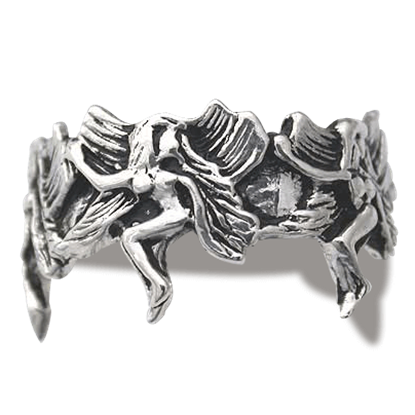 Take this ring for example, which is a pretty accessory that features a ring of pixies as they happily dance, one right after the other. 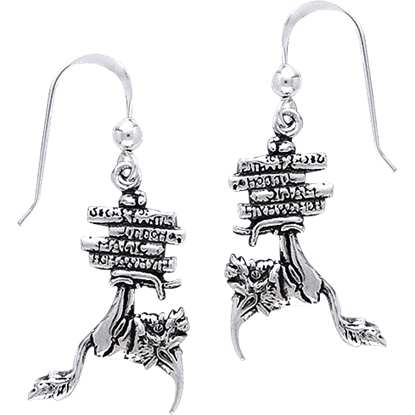 Two magical entities come together in these beautiful and unique Sterling Silver Pentacle Fairy Earrings. The beautiful fairy and supernatural pentacle create a combination that will make your favorite look absolutely mystifying. Balance is necessary throughout all of nature, and fairies have made it their job to maintain that balance. These magical beings happily guide the world into a state of peace and harmony as depicted in the Trinity Fairy Earrings! 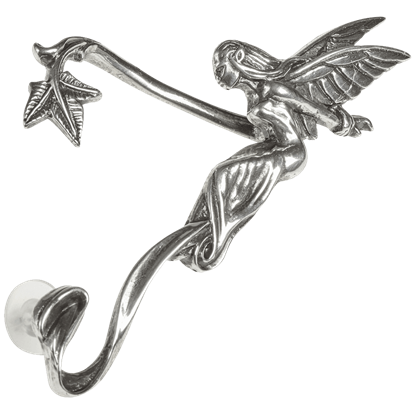 Whispering enchanted secrets, this dainty sprite nestles close to your left ear. An ivy leaf and vine help to hold the Whispering Fairy Ear Wrap in place. Be cautious of dancing into any fairy rings while she rests by your ear. 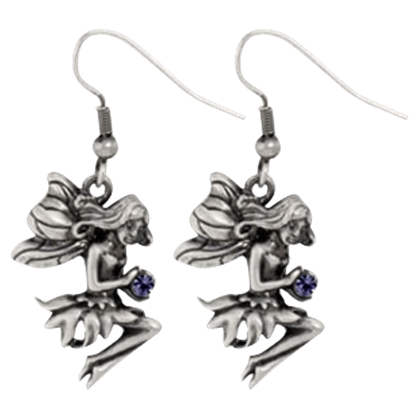 Capturing in a moment of contemplation, the White Bronze Blue Fairy Earrings reimagine a beautiful piece of fantasy art by Amy Brown. This elegant member of the fair folk sits cross-legged with her head resting on a hand. 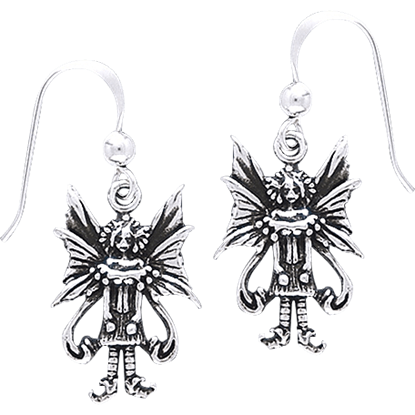 Inspired by the art of Amy Brown, the White Bronze Bookworm Earrings depict a mischievous fairy companion who is balancing several books on his feet. The goblin wears a pointed hat and shoes and has a long tufted tail. Fairies come in all shapes and sizes, including ones that are lighter than air! The White Bronze Bubble Rider Fairy Earrings depict a whimsical fairy who is leaning over the top of a soap bubble to hitch a ride on the breeze. This frazzled fairy has hit the coffee as hard as you on a lethargic Monday morning! 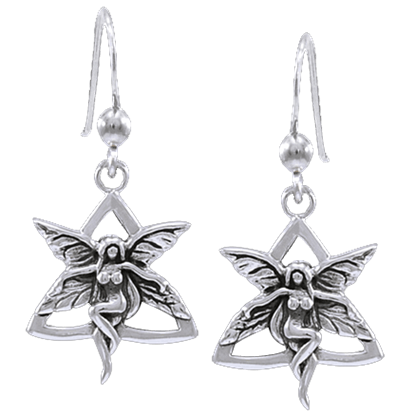 The White Bronze Caffeine Overload Fairy Earrings show off a butterfly-winged member of the fair folk with hair sticking out all around her head.